Mae Chaem is a small town in northern Thailand. Not as small as Mae La Oop. But not very big. 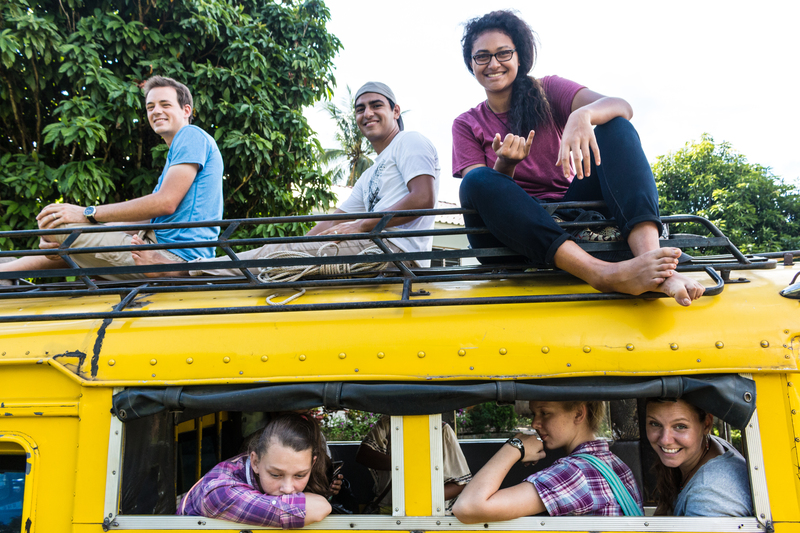 Some people say it will be the next Pai, but not having been to Pai so far, I can’t say. There is definitely not much tourism happening in Mae Chaem . . . yet. The town consists of one main street with some restaurants, a few shops, several guesthouses, an open market and two 7-11’s (which if you have ever been to Thailand you know that is not very many 7-11’s for one town). The town is surrounded by green hills and mountains and the main road overlooks a beautiful valley of rice fields. We stayed at a homestay about two kilometers from the center of the city in an area called Pa Daed. There didn’t seem to be any public transportation, so we only made the long walk into town a few times during our two week stay in Mae Chaem. Mae Chaem is known for having several beautiful wats. We visited a few and two stood out. One was up on the hill across the valley. We took the main road away from the town and turned toward the valley onto a dirt road. 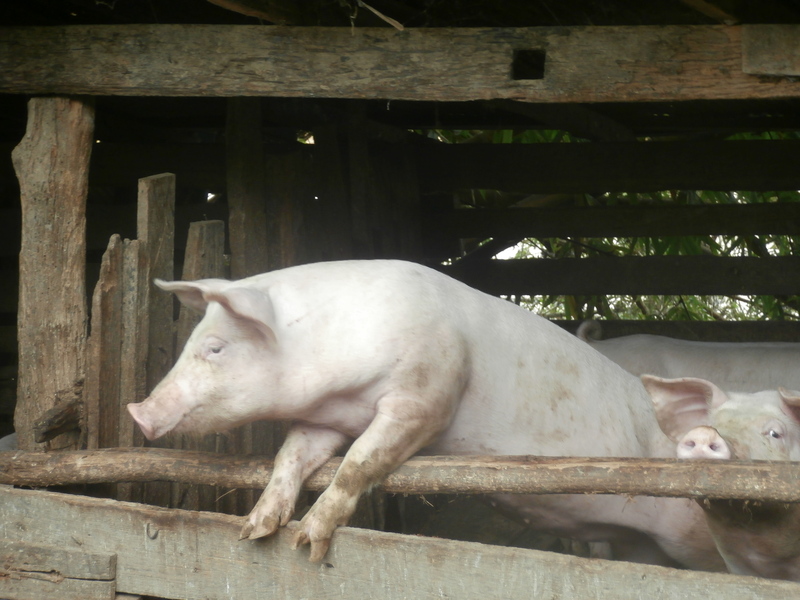 We passed small wooden houses, rice fields, tiny shops selling soda and chips, pig pens, and kids on bicycles. We turned towards the town and ended up at a wat in the middle of the valley. It as a lovely wat, but having seen many wats already in Thailand, it wasn’t overly impressive. But it did have a bathroom. After leaving this wat, we heading up the hill towards the other side of the valley. Soon the dirt road was surrounded by trees. The path split. We were told one path was longer and easier. The other shorter, but more of a scramble. Our group split up. I was feeling lazy and took the longer, easier path. 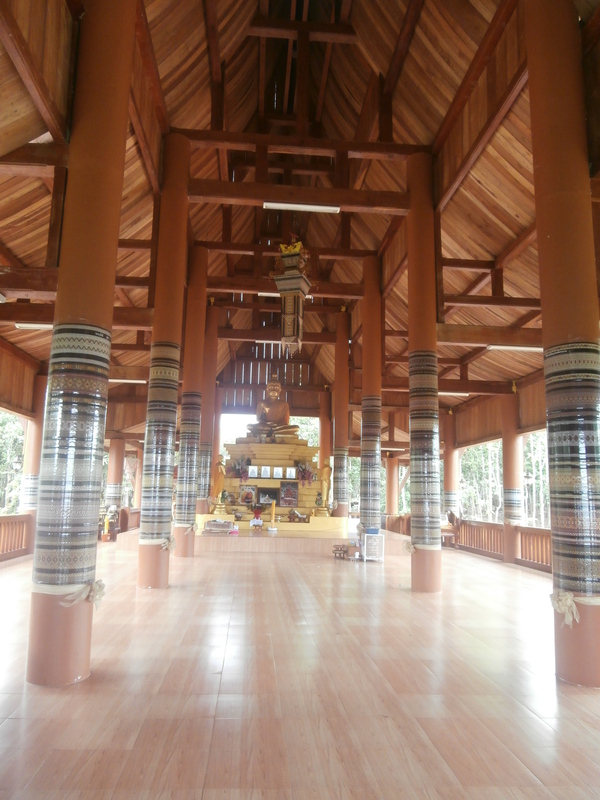 We met at the wat, a large brown structure with traditional Buddhist finials. The wat was open on three sides, perhaps so that the golden Buddha inside could have a view of the valley. It was beginning to rain, so we took shelter under the porch in front of the opening of the wat and enjoyed the view of the valley ourselves. While the wat itself was very simple, the view was spectacular. 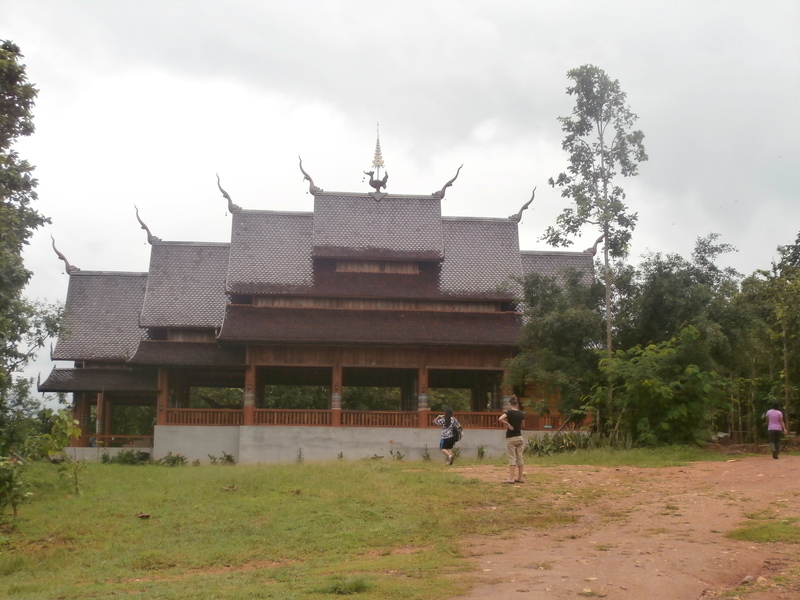 Several days later Rand and I visited the second notable wat, Wat Pa Daed. Again we took the main road away from town. We passed the turn off we took for the wat across the valley to a sign labeled Wat Pa Daed. We had been looking for a different wat, but this one turned out to be more impressive. 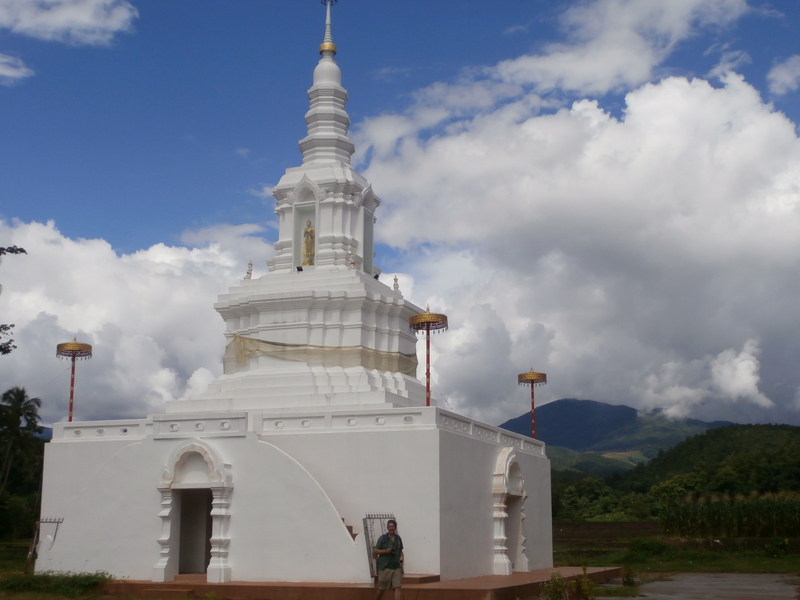 We walked down the dirt road until we came to a white chedi. It shone brightly against the green fields and blue sky behind it. 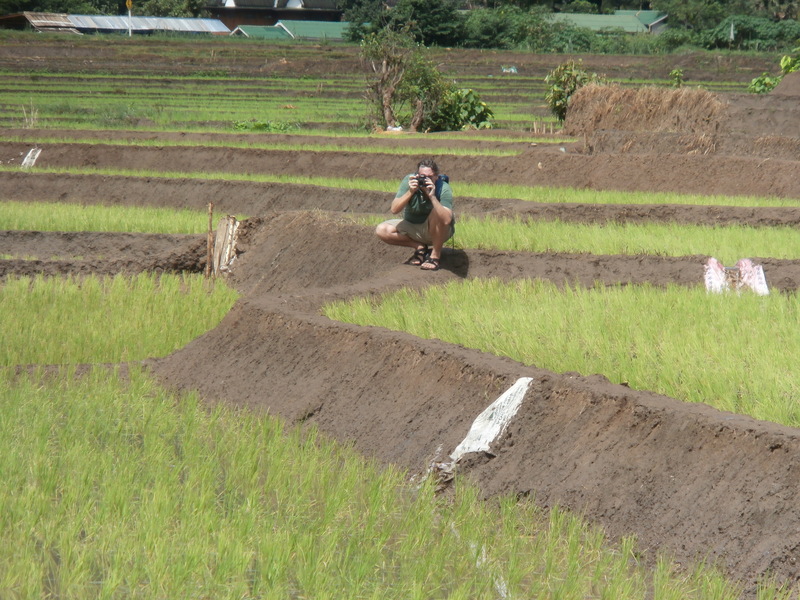 Rand walked out in to the rice fields to take a picture. It wasn’t until I saw the picture later that I understood what he was trying to capture. Across the dirt road stood a small brown wat with a two dragon snakes guarding the path to the entrance. The tropical trees surrounding it gave it a regal feel. The two structures themselves were simple, but the setting made them seem grander. On the main road on the right side of the road going towards the center of town just before the police box is perhaps my favorite place in Mae Chaem, the cake shop. Now, if you have been to Asia, you know that cake is not generally on the dessert menu. 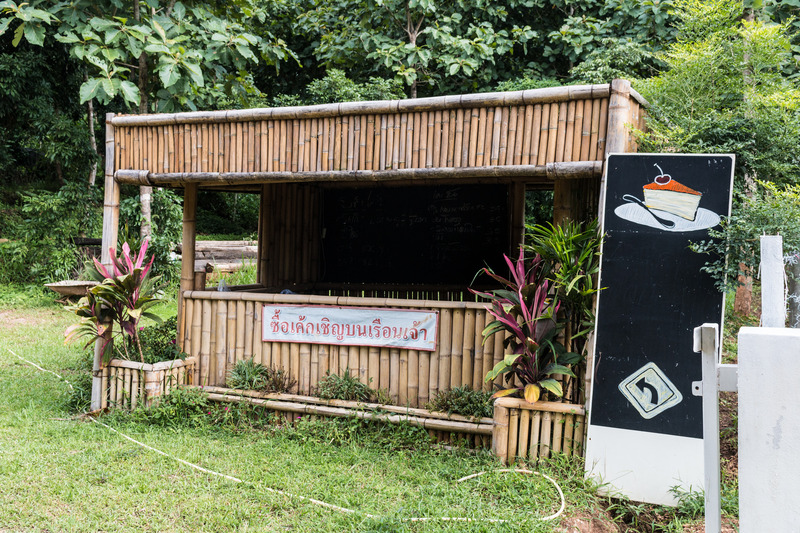 But here, on the road leading into Mae Chaem is a small chalkboard sign with a picture of cake on it. We weren’t sure what to expect when we walked up the hill to a small, white house. We were welcomed in by a little old Thai lady. A glass doored refrigerator held cake. Chocolate cake. Coconut cake. Orange cake. All for only 30 baht a slice. We got several pieces and all the flavors were good, but the chocolate was outstanding. My birthday fell during our time in Mae Chaem and I knew exactly how I wanted to celebrate it. The cake lady was so excited to see us again when we returned to her shop a second time. “Come, come,” she said, a smile lit up her face as she led us to the tables. She didn’t speak much English, but we were able to tell her it as my birthday. “Happy baday, happy baday to you,” she attempted to sing. Now we had another favorite Thai grandma to add to our growing list. On our last day in Mae Chaem, the owner of the homestay next to ours (where the students we were traveling with were staying), offered to take our family and the students in his songtheow to some local sites for 1000 baht for all 12 of us for the day. We thought that was a pretty good deal and he had been a great host to the students (they affectionately called him Pa Samkwan) so we eagerly took him up on his offer. He even let us ride on the top and the back of the songtheow. 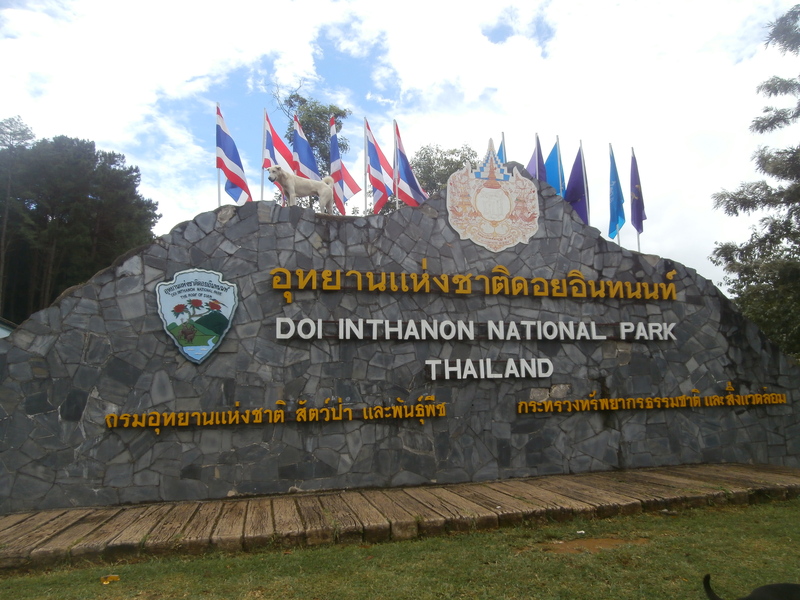 Language barriers being what they were, I didn’t realize until later that Pa Samkwan was taking us to Doi Ithanon National Park. 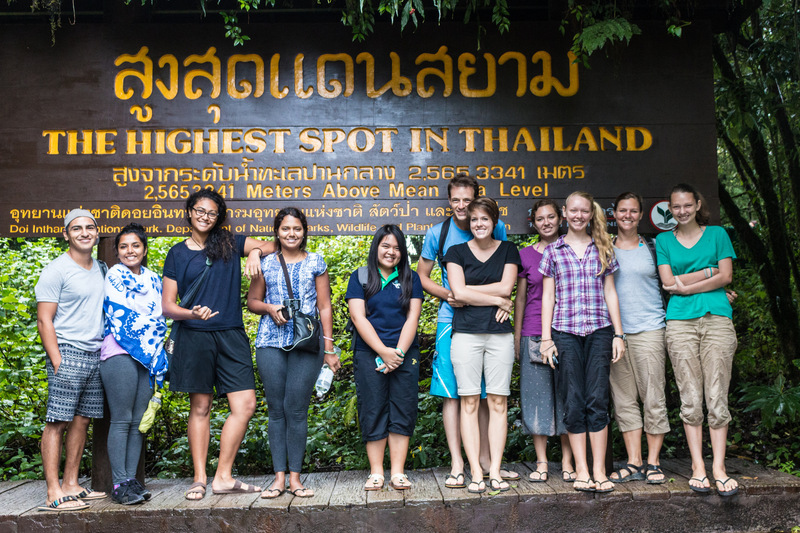 Our first stop was the top of Doi Inthanon Mountain, the highest point in Thailand. We had noticed the air getting cooler as we wound up the twisting roads to the mountain top in the open air songtheow, but when we got out to walk around, we realized just how much the temperature had changed. The only thing we had been told about the day’s activities was that we would be swimming at a waterfall, so we were all dressed in bathing suits and shorts. We were freezing. A path led through the forest to the sign marking the highest point. 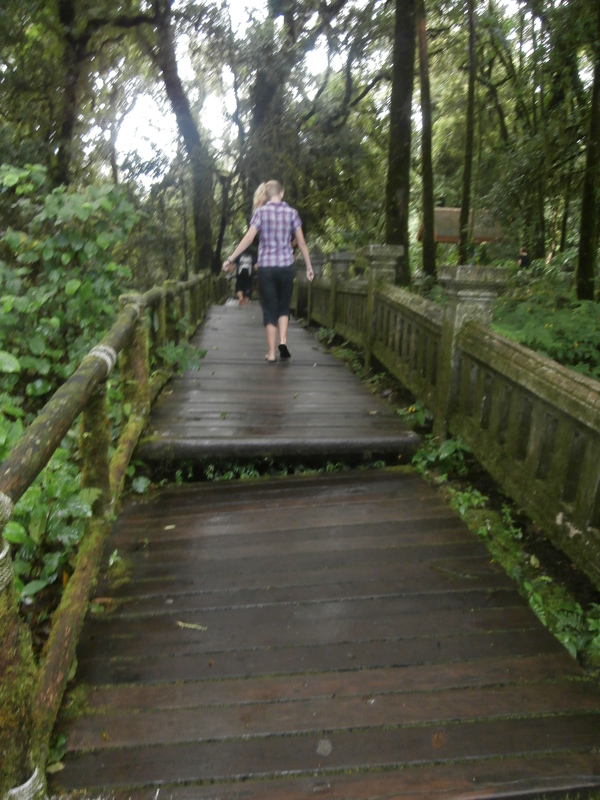 The air was misty and moss covered everything. I felt like I was in the rainforest on the Olympic Peninsula in Washington, but the sign told me otherwise. 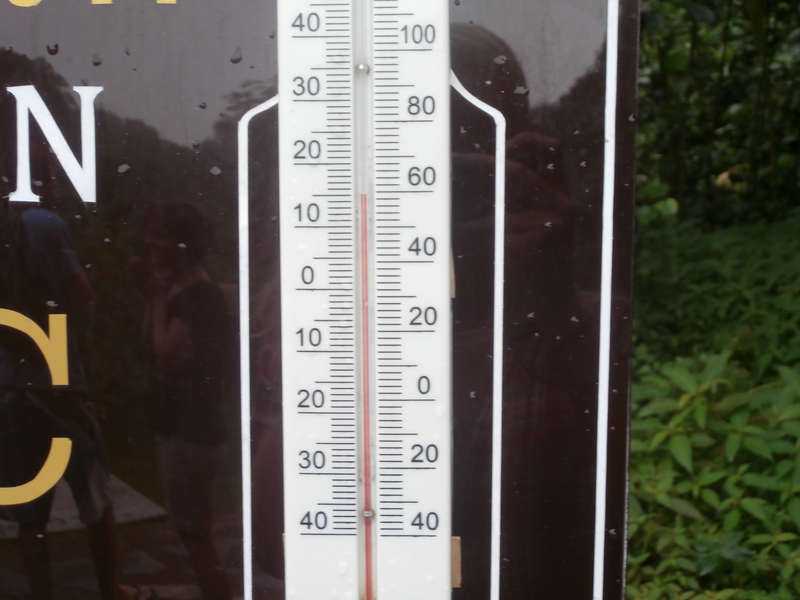 A thermometer measured the temperature at 60 degrees Fahrenheit. Brrrr. We hadn’t experienced temperature that low the whole trip. We happily bought overpriced hot Milo at the concession stand. The next stop was the Royal Chedis. 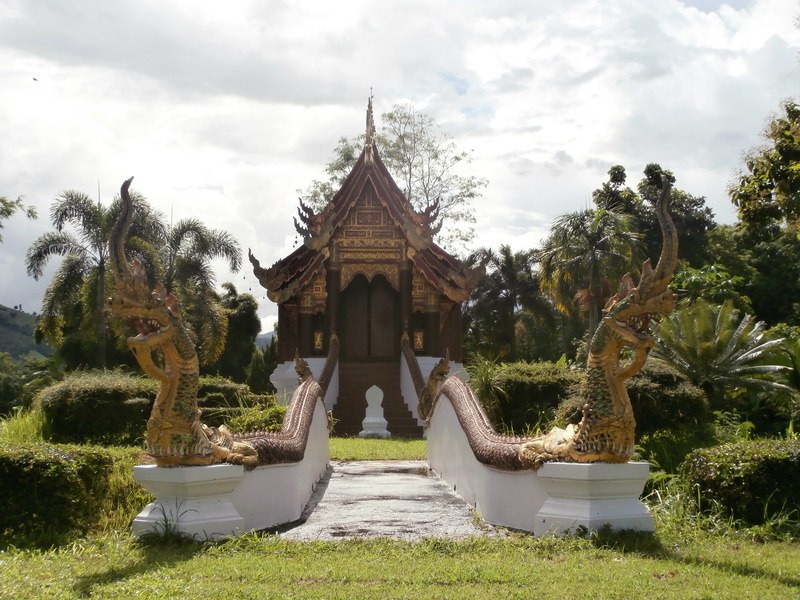 During our visit, I just assumed the chedis were part of an extremely modern Buddhist temple, but I found out later that the twin chedis were built for Thailand’s king and queen in honor of their 60th birthdays. 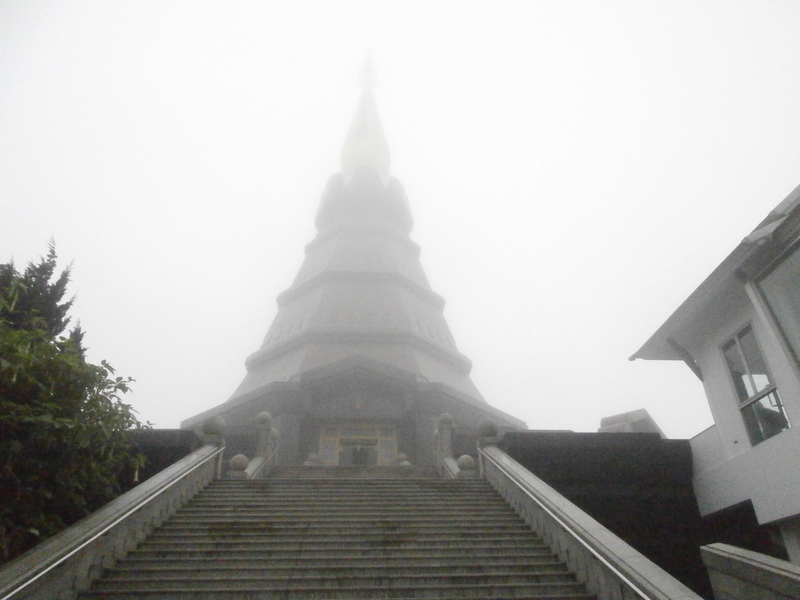 When we arrived, the chedis were shrouded in mist. As we walked up the steps, it felt like we were walking into the clouds. You could hardly see the tops of the chedis. 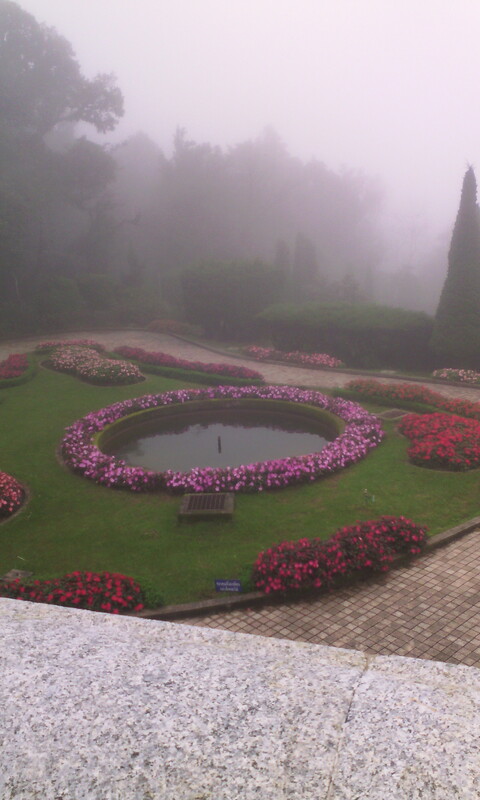 Mist covered the beautiful floral landscape. It would have been an entirely different experience if we had come here on a less cloudy day. The girls loved how the dense fog made the place seem magical. 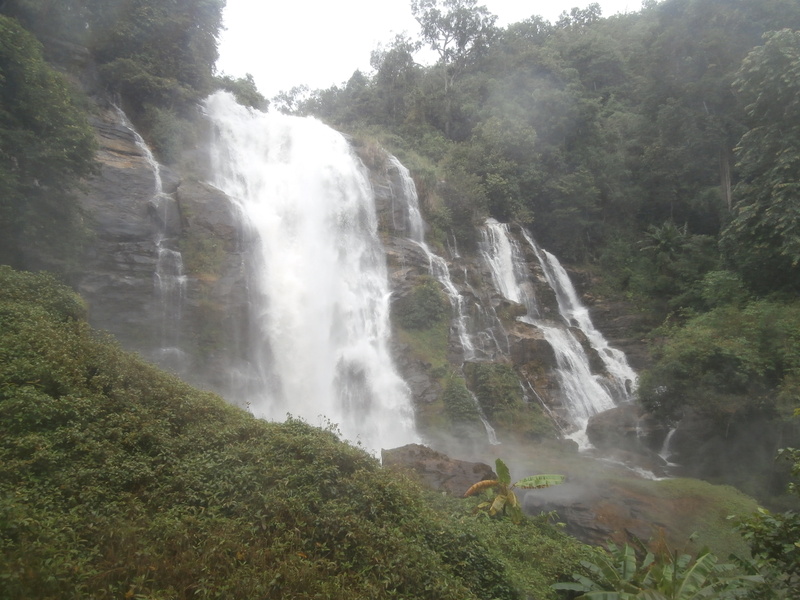 Our final stop was Wachiratharn Waterfall. By the time we got there it was raining. So much for swimming in the waterfall… But we did climb up to check out the falls and snap a few pictures. On the way back to Mae Chaem, we stopped for lunch at the park’s vistor’s center. Our family opted out of the overpriced, not very good food in favor of Pringles and Oreos. The girls had fun playing on the songtheow while we waited for the rest of the group. All in all it was a good day exploring the area around Mae Chaem.